First, the backstory, which happens to be true. In 1972, I was 21 years old, living in my native Ohio, and had come to the conclusion that if I wanted to write about the movies I probably should begin talking to people that actually made them. I started at the top: I wrote a letter to John Wayne asking for an interview. Mary St. John, Wayne’s secretary of nearly 30 years, wrote back to inform me that should I come to California, she would see what she could do about arranging some face time with her employer. About eight weeks later, I was at CBS, where Wayne was shooting a TV special. I found him sitting in front of his dressing room mirror, looking rather glumly at his reflection while his make-up man worked away. He was smoking a little cigar, which took me aback—it was well known that Wayne had lost a lung to cancer eight years earlier. He stood up, held out a hand the size of home plate and introduced himself. “John Wayne,” he said—the most unnecessary introduction of my life. At 6-foot-4, he was only an inch or so taller than me, but he gave the impression of a huge mass, like the football lineman he used to be. A normal-sized man could have stood behind him and never been seen. For the next 90 minutes, I sat in John Wayne’s dressing room and we talked about the movies. He seemed glad to be able to talk about something besides cancer and politics. I was surprised by his manner—quiet, reflective, thoughtful. He responded to my own seriousness about John Ford, Howard Hawks, and Henry Hathaway with sober considerations of how they worked and how they differed from each other. He was both the man you saw on the screen and someone else—far more courteous than his screen image. In retrospect, the fact that he was open to spending so much time with a kid with almost no credentials speaks to his openness and his innate gregariousness, the flip side of which was his dislike of being alone. I have thought often about those 90 minutes. Stimulated by my meeting with Wayne and others in those first years of visiting California, I went on to write a dozen books about the movie business and its protagonists. I was slow to come to the idea of writing about Wayne, even though I didn’t think that any of the (very few) serious books about him that emerged after his death in 1979 got anywhere near an accurate portrayal of the man I met that day. None of them captured the emotional size that accompanied his physical size, and none of them noted the fact that he didn’t feel the need to dominate his every surrounding. The most that could be said about any of them was that they were accurate but not true. The seed planted that day more than 40 years ago finally bore fruit in my book, John Wayne: The Life and Legend, published last year. Since Wayne had been dead for 35 years, I assumed that the book would sell to a modest niche clientele split between the audiences of, respectively, Lincoln Center, Turner Classic Movies, and the Castro Theater in San Francisco. 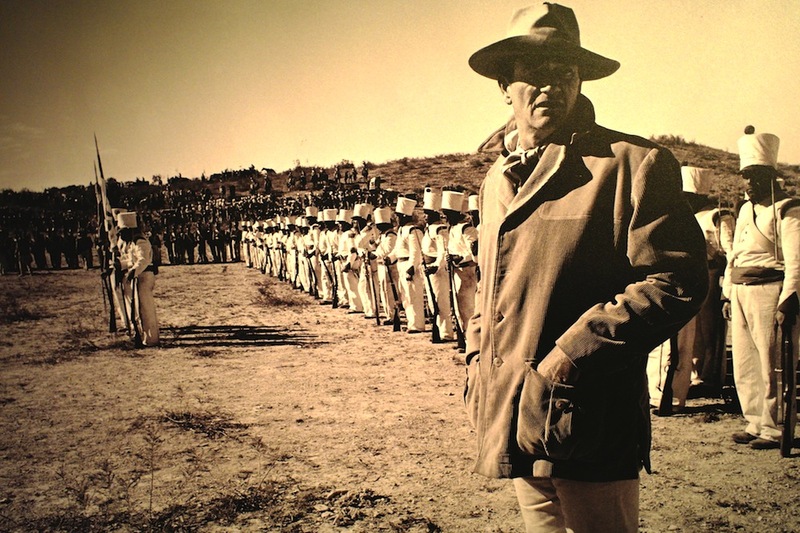 I should have known something was up when the reviews echoed a most unusual unanimity: They seemed grateful that someone had finally taken John Wayne seriously, not just as a symbol of his country, but as an artist. I should have known something was up when audiences at my appearances included women in their 20s and 30s, not to mention men in their 30s and 40s. In talking to them, I realized that John Wayne had long ago transcended the limitations of a mere movie star, almost all of whom are locked into their own time. For instance, nobody talks about Clark Gable anymore, even though Gable was a much bigger star than Wayne for most of his career. Part of it had to do with Wayne’s singular luck in whom he collaborated with. He made more than a dozen films for John Ford, five for Howard Hawks, a batch more for Henry Hathaway and William Wellman—at least 25 first-rate titles by some of the foundational artists of American movies. Of course, the benefits didn’t flow strictly from director to actor; Wayne provided his directors a sense of moral and emotional size that lent a sense of the epic to even modestly sized films. His canon of classic films is part of the reason that Wayne ascended to the level of a mythic ideal handed down from father to son, not to mention father to daughter. Over and over I have heard how people in their 30s and 40s grew up watching John Wayne movies with their fathers and grandfathers, how that love had been passed down like a family heirloom, and how Wayne had come to symbolize manhood at its best, and, occasionally, at its worst, without ever quite sacrificing the audience’s respect. Drive was expected; ruthless was fine; obsessive and crazy were certainly in his wheelhouse. John Wayne meant to portray men who existed above and beyond the quotidian considerations that drive most men—he wasn’t going to play a scene where he waited out a faculty meeting about tenure. He’d known enough quotidian hardship to want to relive it on screen. He overcame a difficult upbringing in an unhappy household beset by financial pressures. He had to drop out of USC when he lost his football scholarship because there was absolutely no money to pay the tuition, and remained committed to an acting career in spite of the fact that he was embarrassed by most of the grim five-day westerns in which he was typecast. He had a wife; he had children; and there was a Depression on. So he knew all about accepting responsibility and grinding it out in a job that was hard to take pride in. Then John Ford gave him the break of a lifetime and cast him in Stagecoach in 1939. And he showed how he understood, as few movie stars have, that movie stars are a projection of the filmmaker’s fantasies every bit as much as they are of the audience’s. So John Wayne became Tom Dunson, driving a herd on the Chisholm Trail and alienating everyone who knows and loves him. He became Rooster Cogburn, a drunken old lawman who can’t always stay on his horse, but can still bring an outlaw to his maker. He became Ethan Edwards, a man compelled to find a kidnapped niece who has become one of the wives of a Comanche warrior. He means to find her and he means to kill her because he considers her no longer worthy of rescue. All these men, and 15 or 20 more characterizations worthy of the adjective great, he played with absolute commitment. He took his audience seriously and he took his responsibilities to that audience seriously. And the result is that today Wayne is indivisible from his country’s strengths, as well as some of its weaknesses. Scott Eyman is the author most recently of John Wayne: The Life and Legend. More information about Eyman can be found at http://www.scotteyman.com/. 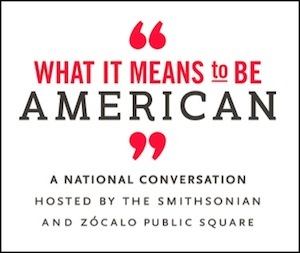 He wrote this for What It Means to Be American a national conversation hosted by the Smithsonian and Zócalo Public Square.